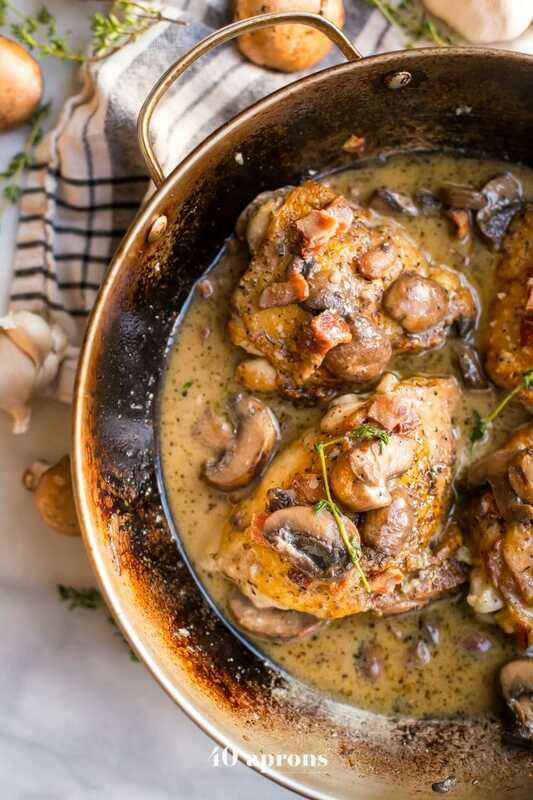 These creamy Whole30 bacon mushroom chicken thighs are absolutely delicious. 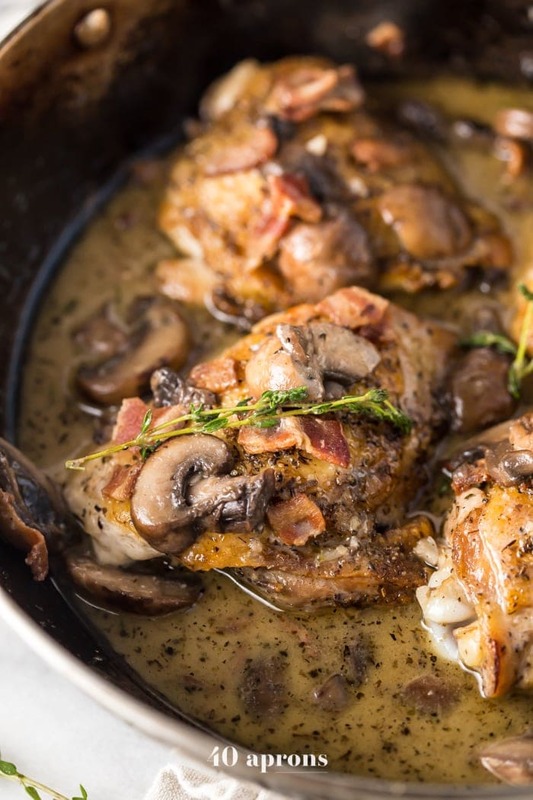 Crispy skin and tender inside, chicken thighs are coated in a creamy sauce with salty, crispy bacon, earthy mushrooms, and fresh thyme. These creamy Whole30 bacon mushroom chicken thighs might become your favorite quick Whole30 dinner recipe! 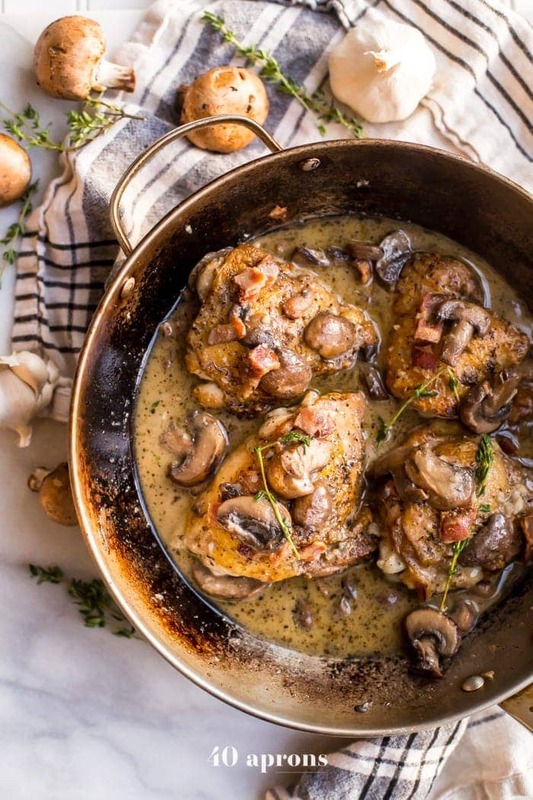 But for a quick Whole30 dinner recipe, these creamy Whole30 bacon mushroom chicken thighs are totally dinner party worthy. I’ve kept this a secret for months. I made them at the tip of the tail end of winter last year, setting up my lights while the sauce simmered away on the range, surprised, then, that I didn’t need to use them at all. The sun was low, but still awake, granting me enough light to shoot these creamy Whole30 bacon mushroom chicken thighs without the artificial glow of my tabletop lights. But with spring on the horizon, I knew I should save this recipe for those early fall days, when we all start craving heartier foods with fresh, woody herbs and richer, rather than lighter and fresher, flavors. So I waited… but you know what? As soon as I tasted the very first bite of these creamy Whole30 bacon mushroom thighs, I knew it was love. The salty, crispy bacon, the earthy mushrooms with their perfect sear, the garlicky, creamy sauce, the heady herbs, and the tender chicken thighs with their crispy skin? I just couldn’t think of a better dish, especially as the sun sets a little sooner each day. In fact, this recipe for creamy Whole30 bacon mushroom chicken thighs quickly became the foundation for so many more recipes of mine, including the cranberry apple chicken thighs with rosemary I’ll be posting shortly, not to mention the apple bacon rosemary chicken thighs coming up here soon. You see, I’d perfected the chicken thigh years back, with its crispy skin and super tender meat, pan searing to treat that rich skin and finishing in the oven to cook things just right. Adding bacon and mushrooms was just kind of the next obvious step. 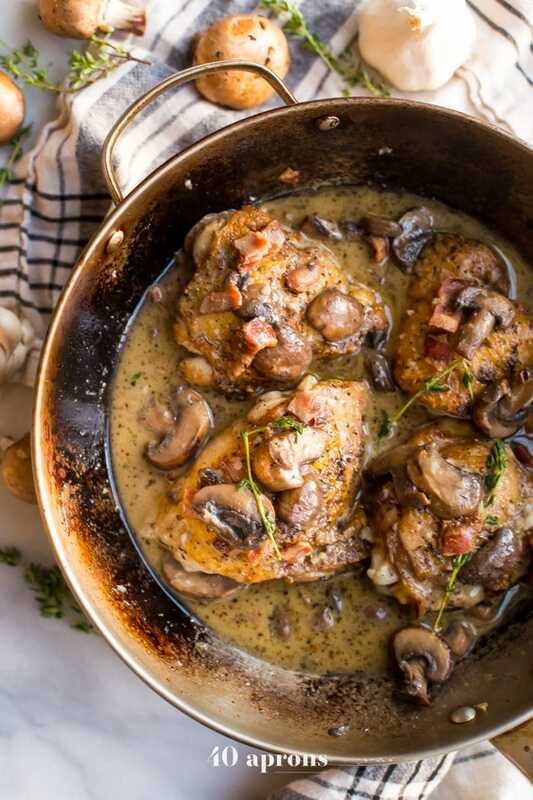 These creamy Whole30 bacon mushroom chicken thighs are easy enough for a quick Whole30 dinner on a weeknight but elegant enough for company. As a bonus, you’ll have your friends all clamoring for information on the program, because you can seriously eat this on a Whole30?! I made this today and it was incredible! Will definitely make this again and again! Thank you for sharing this recipe! I am so so happy to hear that! Thank you Bev! Fantastic recipe, thanks for sharing it! I used the usual boneless skinless breasts because that’s what I had on hand. It was wonderful, but I have no doubt that it would’ve been even better as written. Will absolutely make it again! This has become my go-to comfort food recipe – was looking for something creamy and mushroomy when doing a whole 30 and i found this on google… led me to your site, which is my new fave! 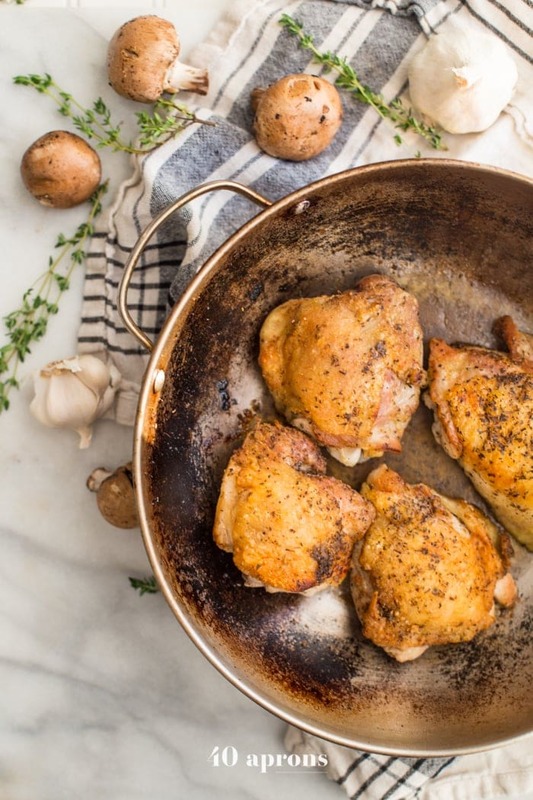 this dish is amazing… such a great way to cook chicken. not only is this the best flavor ever, i actually find that this recipe helps me with an issue i have with chicken thighs… i find that they never taste as good, they almost taste bad, when i reheat them in either microwave or oven. it must be related to the fat, b/c it doesnt happen for me w/ chicken breast. anyway, it DOESNT happen in this recipe. i eat 2 for dinner and reheat one each for lunch the next 2 days and it’s perfect both ways! This is good enough for company! I had to use 1/2 prosciutto because I didn’t have enough bacon. It is so delicious and flavourful. I can’t wait till my husband gets home to try it. Thanks for another wonderful recipe Cheryl. This was by far the best Whole 30 recipe we have made. The leftovers are just as good too. Over cauliflower puree made it restaurant quality! I even subbed salmon one night and it was just as good. Thanks for our new staple! I’m SO glad you like it! And love that it’s so versatile. Thank you so much for letting me know! I don’t know in what world it takes 13 minutes to cook this chicken in the oven. It takes at least 45 minutes uncovered so plan on adding more cooking time. After a total of almost two hours, dinner was done and was well worth the wait! This one is a crowd pleaser for sure! I plan to make this on Monday night next week and I’m already looking forward to it!! Is it imperative to cook this in an oven-proof skillet? I’m a newlywed and I do not have one yet. 🙂 I can probably borrow from my mom or a friend if this would interfere with the meal! Best Whole30 recipe I’ve tried! Boyfriend (who is not on Whole30 and quite a picky eater) went back for seconds. Thank you! Picky eater win!! That’s so great 🙂 so glad you liked it! This was absolutely my favorite Whole 30 recipe thus far! Thanks so much! That makes me so happy Jene!! Do you leave it skin side down when you put it in the oven? I prefer to flip them skin-side up. They get crisper that way! We had this for dinner on Monday and it was delicious! The perfect recipe to make when you’re Whole30-ing, but your husband and kids aren’t 😉 Everyone loved, and no one missed the typical cream sauce made with cream. Definitely making again. Ah! I’m soooo glad you made it and liked it 🙂 Are you Whole30ing? That’s exciting! I made these exactly per recipe tonight, and it was absolutely delicious. I served them with roasted Brussels sprouts, and the meal was a big hit with everyone (husband,5 year old, 3 yr old and 1 yr old). Thanks for such a great Whole30 recipe! I’m SO glad you all liked it so much! Do you cover the pan before putting it in the oven? Have you every tried this with boneless thighs? That’s what I have but not sure how the time would differ. I did it last night with boneless skinless thighs. After cooking the bacon, I turned off the pan and added the chicken and let that sear in the residual heat while I seasoned the other side of the chicken. Then I put it in the oven for 18 minutes. I make it with skinless boneless thighs I get from Costco and it’s amazing!!!! Could you use chicken breasts instead of chicken thighs – if so, any modifications for cooking? This was so amazing! I put some of the sauce over some green beans and that was super good too! Thank you for a delicious recipe. Sounds delicious! I’m SO glad you liked it Cori! Does it need to be coconut milk? I have almond milk but I know the consistency is not the same. I would definitely recommend full-fat coconut milk for this, otherwise it won’t be nearly as rich or creamy. Do you shake the can of coconut milk then pour 1 cup or do you use the cream only? Thank you for the delicious recipe (and for teaching me how to make perfect chicken thighs!) My family loved it! PS – I just voted for your chili! Tried this tonight and I will definitely make it again. Only change I made was adding about 1/2 cup of diced onions with the mushrooms. Do good!! This looks like a beautiful dish! Chicken breasts get all the love, but I loooove me a good thigh. Right?! I’m a thigh lady myself 😉 So tender, and that skin! Girl, this recipe looks so freaking good! Love the deep sear on the chicken. Yum!